With Serena Williams out of the running, one established truism at this year’s U.S. Open was that the list of potential champions had expanded. Yet, Caroline Wozniacki’s form the first three rounds is giving many room for pause as she is invariably validating her top billing. With the initial week of competition concluded, here’s a recapitulation of the event thus far and a peak at what’s ahead. Wozniacki has permitted her opponents only three games on her way to booking her spot into the round of 16. Although Maria Sharapova needed three sets in the first round against Jarmila Groth, since then she has also been stingy. Sharapova allowed Beatrice Capra, the 18 year old American who upended 18th seed Aravane Rezai, just one game in their third round match. As a result, the much anticipated fourth round match between Sharapova and Wozniacki will take place on Monday. After scraping by to reach the third round, Jelena Jankovic, the 4th seed, had her progress halted by Kaia Kanepi, the 31st seed. Therefore, for Jankovic, the disappointment at the majors go on. Kanepi will face Yanina Wickmayer, the 15th seed and 2009 U.S. Open semifinalist, in the round of 16. Vera Zvonareva, the 7th seed, has been keeping a low profile while calmly taking care of business. Without dropping a set, Zvonareva is now in the fourth round where she will battle Andrea Petkovic. Zvonareva is clearly the favorite in that clash and with Jankovic ousted, she has a great chance to earn a berth in the semifinals. Na Li, the 8th seed, and Agnieszka Radwanska, the 9th seed, were booted in the first and second round respectively. With Li sent packing, Dominika Cibulkova was the beneficiary. Cibulkova is alive for the first time in the fourth round at the U.S. Open and will face Svetlana Kuznetsova. Since falling under the tutelage of Amelie Mauresmo’s former coach, Kuznetsova has rediscovered the road to success. Kuznetsova should have no trouble punching her ticket to the quarterfinals for a date with either Sharapova or Wozniacki. In the bottom half of the draw, Melanie Oudin, last year’s American darling, was bounced in the second round. Franscesca Schiavone, the 6th seed and reigning French Open champion, has finally found her game on hardcourt. The Italian heads to the round of 16 having yet to surrender a set. Schiavone’s next obstacle will be 19 year old Anastasia Pavlyuchenkova. The Russian’s third round showdown with one of the favorites for the title Victoria Azarenka never came to fruition. In her second round match, Azarenka collapsed and was forced to retire. Initially, the problem was ascribed to the scorching temperatures. Later on, the news was released that Azarenka had suffered a mild concussion prior to taking the court which was the culprit for her abrupt egress. With Pavlyuchenkova dominant on hardcourt this season, it will be fascinating to see whether teenage fearlessness or experience wins out. With the exception of 2004 and 2006 when the Venus Rosewater trophy was leased by Maria Sharapova and Amelie Mauresmo respectively, Venus and Serena Williams have been the proprietor of the Wimbledon title eight out of the last ten years. In fact, the Williams sisters have been interchangeably the winner and runner-up the ultimate two seasons. With Serena and Venus as the top two seeds in 2010, a three-peat in the finals is plausible. However, with Justine Henin having reincorporated herself into the tour with the express objective of hoisting the Wimbledon trophy and compatriot Kim Clijsters a formidable force after rejoining the circuit last summer, a new decade may mark the end of the Williams’ dominance. Here’s a preview of the draw and the potential obstacles for the chief contenders at the All England Club. If the outcome is as anticipated, Serena will meet Maria Sharapova in the round of 16. Despite struggling with her serve since her shoulder surgery, Sharapova has posted some good results the last couple of months. Moreover, Sharapova reached the finals in Birmingham two weeks ago. Thus, depending on how well Sharapova plays, the possibility of an upset is undeniable. With the Birmingham title under her belt, Na Li is a secondary threat in Serena’s section. A semifinalist in Australia where she loss in two tiebreaker sets, Li has the weapons to irritate Serena if she gets to the quarterfinals. Either French Open finalist Samantha Stosur or Caroline Wozniacki could be Serena’s semifinal opponent. 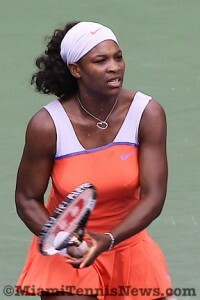 With her recent history at the French Open against Stosur, Serena may have her work cut out for her. Beforehand, Stosur and Wozniacki may have to battle it out in the quarterfinals. Looking further back, Wozniacki may have to deal with Victoria Azarenka the 14th seed in the fourth round and Stosur with Flavia Pennetta the 10th seed also in the round of 16. Since clay is Pennetta’s best surface and with the Italian never making it pass the fourth round, Stosur should prevail. For Azarenka, the finalist in Eastbourne, a knee injury may be the limiting factor regardless of the rival she faces. Focusing on the bottom half of the draw, the Wimbledon grass seems to have restorative properties for Venus irrespective of her previous results. With two titles and finalists status in Miami and Madrid, Venus is in stellar shape. Venus’ path looks relatively unencumbered until the quarterfinals where she could battle Marion Bartoli or French Open reigning champion Francesca Schiavone. Still with Venus’ past performance, the scales are heavily tipped in her direction. With last year’s champion, a retired Amelie Mauresmo looking on, top seed and 2009 finalist Elena Dementieva survived Lucie Safarova 6-7,6-1,6-4 in the finals of the Open GDF Suez to seize her second premier trophy of 2010 and her 16th career title. Safarova followed a love opening service game with a break. Then, the Czech consolidated for a 3-0 lead. With good serves including an ace, Dementieva rescued a 0-30 game to capture her first game. When Safarova erred with a backhand down the line, Dementieva had her initial break point. The Russian capitalized when Safarova misfired on the forehand. After a comfortable service game, Dementieva tied the set at 3 a piece. Hence forth, with neither player able to manufacture a break point, the set went to a tiebreaker. Ahead 5-4, Safarova produced a beautiful backhand crosscourt winner for the minibreak. With awesome defense, Dementieva saved one set point. However, on Safarova’s second attempt she succeeded with the forehand up the line winner. In the second set, Dementieva quickly shifted the momentum. By forcing Safarova into a backhand down the line mistake, Dementieva had double break point. Elena converted when Lucie netted a forehand. Subsequently, Dementieva held at love to increase her advantage to 3-0. With Dementieva finding the range on first serves and winning the majority of second serve points, Safarova saw the second set flash by. Through donating more errors, Safarova gave Dementieva a double break lead. The Russian closed the set with a routine service game. In the decisive set, Safarova found her form once again and carried the first game. Yet, to Safarova’s chagrin, Dementieva continued her high level of play. Moreover, Elena’s vulnerability, her serve, was not cracking. After knotting the set at 2 all with a forehand up the line winner, Dementieva pressured Safarova into three consecutive backhand mistakes to erase two game points and get to deuce. Although Safarova salvaged that game for a 3-2 edge, it was a sign that her ship was about to leak. Safarova’s next service game, with some great returns, Dementieva secured double break point. When Lucie misfired on a forehand up the line, Elena banked the break for 4-3. Then, without any trouble, Dementieva consolidated for 5-3. After a difficult hold which included rubbing out two championship points, Safarova extended the match at 4-5. Serving for the trophy and with her ninth ace for 30-0, Dementieva faltered. Due to three straight forehand errors, Dementieva faced a break point. Luckily, Elena’s serve responded by forcing Lucie into an error for deuce. Later, with a forehand volley winner, Dementieva arrived at her fourth championship point. Elena bagged the trophy when Lucie’s backhand crosscourt failed to clear the net. Madrid was the scene for the WTA’s last premier clay court tournament where world number one, Russian Dinara Safina, battled ninth seed, Dane Caroline Wozniacki. Safina destroyed Wozniacki 6-2, 6-4 in the finals of the Mutua Madrilena Open for her eleventh career trophy. After both players saved break points in their opening service games, with two unforced errors by Wozniacki, Safina had double break point. Dinara converted with a forehand crosscourt winner and took a 2-1 lead. By gorging on backhand down the line winners, Dinara was able to consolidate. Afterwards, Safina broke again for a 4-1 advantage. As Wozniacki’s error tally mounted, Safina cemented the first set at 6-2. In the second set, with a forehand up the line mistake by Wozniacki, Safina arrived at break point. The Russian captured the lead with another forehand error by the Dane. Then, with a backhand down the line winner, Safina pulled in front 2-0. Serving at 2-1, Safina made an unforced error causing her to face break point. But, Dinara chased down a volley by Caroline to produce a winner for deuce. Subsequently, with a few more faults from Wozniacki, Safina held for 3-1. Henceforth, neither competitor had a miscue on serve until the eighth game. Leading 40-0, Safina committed three straight errors and with a well-concealed forehand dropshot winner, Wozniacki had break point. However, a backhand crosscourt grazing the tape denied Caroline the opportunity to equalize the set. The tenacious Dane got another break point with a superb backhand volley winner. Still, Safina turned Wozniacki away with a winner. After Caroline failed to capitalize on a third break chance, Dinara secured this seven-deuce game and a 5-3 lead. After being unsuccessful on a match on her opponent’s serve, Safina benefited from a multitude of errors by Wozniacki to secure the championship. Today, France’s Amelie Mauresmo demonstrated that writing her tennis obituary might be premature. Mauresmo defeated Russian Elena Dementieva in the finals of the Open GDF Suez in Paris 7-6, 2-6, 6-4 to capture her 25th trophy and her first in two years. Off the bat, Mauresmo went down a break after netting a volley. Luckily, with a double fault, Mauresmo got a break point and delivered when Dementieva’s backhand crosscourt went long. After the players traded breaks again; at two all, Dementieva secured another break with a forehand crosscourt winner and then consolidated with a love game for 4-2. The next game was pivotal as Mauresmo saved a break point and held for 3-4. As Dementieva served for the set at 5-4, Mauresmo’s versatility, particularly on the backhand, forced errors from her opponent, allowing her to break. The set went to a tiebreak. With a forehand winner, Dementieva had set point; but it vanished when she was unable to pass Mauresmo at net. Subsequently, Amelie, herself, arrived at set point when Dementieva’s crosscourt forehand found the bottom of the net. Then, Amelie handcuffed Elena with a great body serve to wrap up the set after 1 hour and 14 minutes. With a double fault and a few errors from Dementieva, Mauresmo had the early break in the second set. However, after being ahead 30-0, Amelie made some rare backhand errors to relinquish her lead. After appearing to be on her way to an easy hold at 40-15, Mauresmo misfired on the backhand again and mistimed a ball which ended up going over her racket giving Dementieva the winner and a service break. At 2-5, Mauresmo double faulted to hand Dementieva set point and double faulted anew to gift her the set. 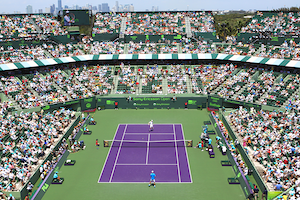 Along with the summer temperatures, the action on court is scorching at the first major of the year. Let’s review the key developments of the initial week and try to predict what could unfold the last days at the Australian Open. The unexpected casualties in the preliminary rounds were Ana Ivanovic and Venus Williams, the fifth and sixth seeds, respectively. Venus was shocked in the second round by Spaniard Carla Suarez Navarro after having the match on her racket. Suarez Navarro, a quarterfinalist at last year’s French Open, is now in the round of 16. Ivanovic, the 2008 finalist, was eliminated in the third round by 19 year-old Russian Alisa Kleybanova. This was not a great surprise. Since winning the French Open, Ivanovic has yet to make it past the third round at a major. Agnieszka Radwaska, the ninth seed, fell in the first round, beaten by Kateryna Bondarenko. The biggest upset on the men’s section was David Nalbandian, the tenth seed, going down in the second round to Yen-Hsun Lu ranked 61. As we enter the meat and potatoes part of the tournament, the top four men remain on track to collide in the semifinals. With the exception of Novak Djokovic, the defending champion, Rafael Nadal, Roger Federer and Andy Murray have looked extremely sharp. Of the two Americans left, Andy Roddick, the seventh seed, may represent the biggest headache pending on Djokovic’s side of the draw. Roddick’s recent weight lost and coaching change appear to be paying dividends. Andy has dispatched his opponents expeditiously, so an upset could be brewing. James Blake, the ninth seed, has played very well. However, Blake will meet last year’s finalist, Jo-Wilfried Tsonga, in the round of 16. Vanquishing Tsonga may be too tall an assignment for the American. Nadal will face Fernando Gonzalez, the 2007 finalist. Gonzalez may not have much left in the tank after his high quality, over four hour long, five setter against Frenchman Richard Gasquet. Federer will battle Tomas Berdych. Should Roger advance, waiting will be either Juan Martin Del Potro or Marin Cilic, two tough customers. The French are assured of having at least one man in the quarterfinals with Gilles Simon and Gael Monfils playing one another next. With the leftover field competing so well, the odds maker may need to reshuffle their numbers. The favorite may have to be Nadal, Federer and Murray in that order. As another season concludes on the WTA, its is only fitting to reflect on the moments that branded it and look forward to what might be in store for 2009. The Russian onslaught continues with half of the players ranked in the top ten coming from that nation. One of the pack’s standouts, Maria Sharapova, bulldozed over her opponents to win the year’s first major in Australia. However, after an impressive winning streak, Sharapova went on forced sabbatical due to an old shoulder injury resurfacing. Dinara Safina and Vera Zvonareva finally lived up to their promise, as these two had a phenomenal run in 2008. Sporting new coaches, these two women known for their volatile outburst on court, bottled their tempers which translated into great results. Safina’s newfound mental solidity carried her all the way to the French Open final. For her part, Zvonareva was a finalist at the year-end Sony Ericsson Championships where she lost a heartbreaking match to Venus Williams. Moreover, this powerhouse of tennis swept the medals at the Olympics with Elena Dementieva taking gold, Safina silver, and Zvonareva bronze. In team play, the Russians were also supreme, crushing Spain to grab another Federation cup. The Serbians also became more firmly entrenched in the sport. After her defeat in the Australian final, Ana Ivanovic claimed her first major in Paris. Compatriot Jelena Jankovic made her first majors’ final appearance at the U.S. Open, but lost a tough three setter. As a result of the French Open title, Ivanovic captured the number one ranking. But with a niggling thumb injury, Ivanovic struggled the remainder of the year. On the other hand, Jankovic overflowing with confidence after her great U. S. Open showing, won three straight tournaments and finished the year at number one. Jelena is the third player after Lindsay Davenport and Martina Hingis to hold that honor despite failing to earn a major trophy. The Williams sisters persist as the beacon of light of American tennis with Venus shining on her best surface, the grass at Wimbledon. Venus seized her fifth title at sister Serena’s expense. But the latter’s tears were short-lived as the siblings took the Wimbledon doubles title and repeated with doubles gold in Beijing. Moreover, Venus showed that at 28, she still could keep up with her younger peers by winning both in Zurich and at the prestigious year-end championships. While Serena, no spring chicken herself, prevailed for the third time at the U.S. Open.